Can you Reheat Jacket Potatoes? | Can You Reheat? Can you Reheat Jacket Potatoes? I have always made my jacket potatoes in batches, but I never thought of another way to reheat them other than the oven? I heard the microwave is okay? Can you reheat jacket potatoes? 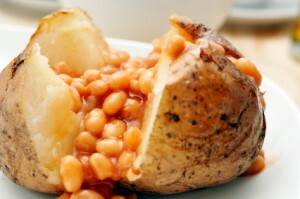 Can you reheat Jacket Potato? Yes, the microwave is quite effective at reheating spuds, and it takes a fraction of the time it does in the oven. Before using either of these methods, ensure there are no perishable toppings! Meaning leave the salsa, sour cream, and similar toppings until you are ready to eat. Place your spud in a microwave-safe dish, and microwave on MEDIUM power for two minutes. If you had the spud on its side, flip, and microwave for another minute. Check for desired warmth, depending on the potato, it could take another minute to warm all the way through. *There have been multiple cases where the skin of the potato will become soggy. You can wrap the spud in a paper towel to help reduce the condensation. However, it should be noted that the skins will not crisp up in the microwave. For those of you who want to go a more traditional route, simply place your jacket potato onto a baking sheet. Once the oven has come to temp, place the baking sheet on the bottom rack, closet to the heat. Bake for 15-20 minutes and remove carefully as the insides will be extremely hot! Now before anyone flips over not wrapping it in foil, this is left out because you want to have crisp skin. The foil keeps moisture in, therefore, soggy skins.